THE STEEP 4.7 MILE MEYSAN LAKE TRAIL leads to a beautiful alpine lake basin. It also provides access to the climbing routes on Lone Pine Peak, Mt. Mallory, "Candlelight Peak", and other peaks. TRAIL DIFFICULTY - Strenuous - especially for those not acclimated to high altitude. This trail is infrequently maintained and may be difficult to follow in places. The section from Camp Lake to Meysan Lake is a faint path on a rocky slope. SEASON -The trail is free of snow from May to early October in normal years of snowfall. WHITNEY PORTAL CAMPGROUND is located 12 miles west of Lone Pine on Whitney Portal Road. Whitney Portal Road intersects Highway 395 at the traffic signal in the center of Lone Pine, The road is usually open from May to early November. In winter, the last 6 miles of the road are not plowed. Hikers must walk through the Whitney Portal Campground to reach the trailhead. Enter the campground on the blocked access road from the designated parking area on Whitney Portal Road. Check the map posted on the bulletin board and follow the directional signs through the campground. Summer days may be quite, warm at lower elevations but temperatures at Meysan Lake are usually cool . Night temperatures frequently drop to freezing or below even in summer, In summer, afternoon thunderstorms are common. Snowstorms normally occur from September to mid-May. Good boots, rain gear, and warm clothes are essential. Sunglasses, a sunscreen (factor 10 or more), a visor or hat and mosquito repellent are advisable; Ice axe and crampons are usually needed in spring and early summer. Carrying your own water is recommended as water is not easily available along the trail. Giardiasis is a problem. Boil all drinking water three minutes. Campgrounds are available. Contact the Mt. 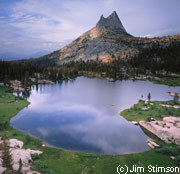 Whitney Ranger District; P.O. Box 8; Lone Pine, CA 93545; 760 876-6200. A wilderness permit is required for all overnight and day hikes. Pack and saddle stock are prohibited. In the past, campfires have resulted in aesthetic and physical damage to the wilderness. Standing dead snags are an important part of the natural beauty of the backcountry. Discharging of firearms in the wilderness is permitted only for taking of wildlife as allowed by state law. Do not short-cut switchbacks; walking out of the established trail hastens destructive erosion, deteriorates the trail, and further scars the land.